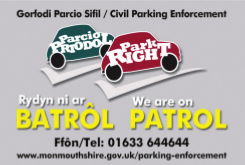 From Monday 8 April 2019 we’ll be responsible for civil parking enforcement or CPE. This means that it will be us and not the police that enforce most on and all off street parking restrictions across Monmouthshire. If you park in breach of traffic regulations you will be subject to a fine called a penalty charge notice or PCN. Money raised through PCNs will go towards the cost of running CPE. Any surplus income will be reinvested in transport initiatives and road improvements, in line with Department for Transport guidelines. Under CPE there’ll be better enforcement of existing parking regulations. This will lead to better parking in areas where there are restrictions, as well as improved turnover of parking spaces – supporting town centres and shopping streets as it will be easier for visitors and shoppers to park. CPE helps to improve safety of pedestrians and road users as people aren’t able to flout restrictions such as double yellow lines or zig-zag markings.